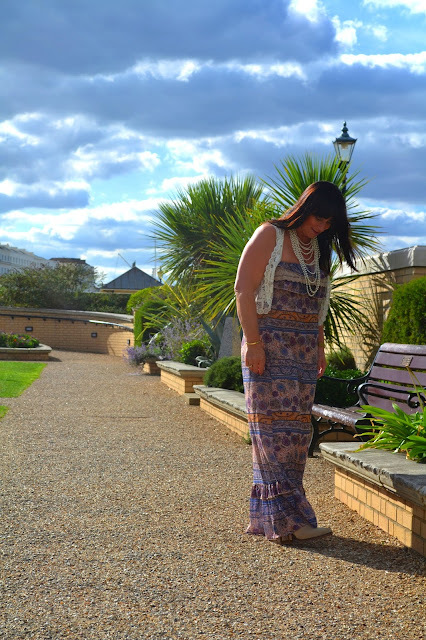 Throw back Thursday - Styling a long dress with booties. Hello, how do I find you? Hopefully all good. Today has been rather busy, but most importantly spending some precious time with my princess. She is sooo adorable, just love being with her, and to say doing nothing when she's around is an under-statement! Suffice to say everything could and did wait! Hence now I'm blogging into the night, catching up and planning for the next weeks. Therefore today I've nothing to blog about, nothing, nada, zilch! 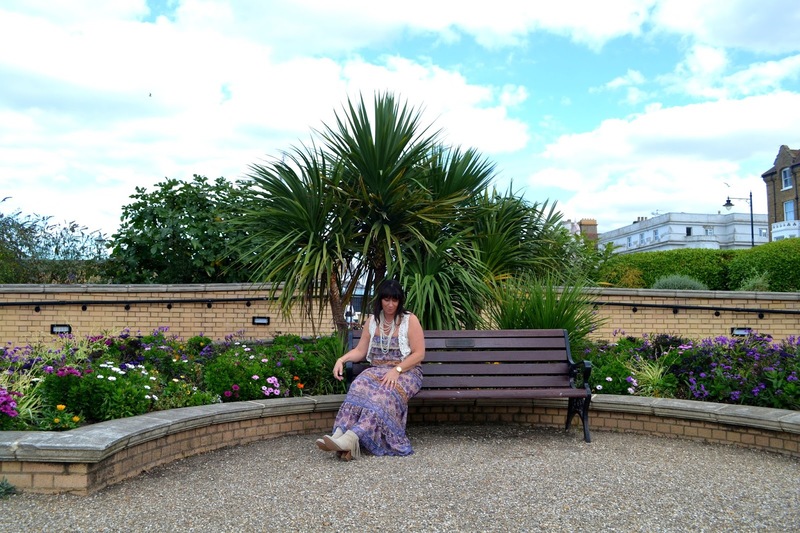 So I was thinking how about sharing a post I had the photographs taken for back in the latter stages of the summer - yes that seems like a lifetime ago when in - fact it was merely a month ago! It was on a Thursday when the photos were taken, on a sunny warm day at the end of September, so a throw back Thursday of sorts! I wanted to show an outfit based on booties with a maxi dress, which I could happily wear now, however I would add a jumper over the maxi for a warmer, cosier feel. I love these booties, each time I put them on they feel so special, do you ever get that feeling when you wear a specific item? I think It's because I'd wanted something like this for ages, so when I found them - and they fitted well - and they were a fantastic price - and they look so dam good, the feeling was complete! These are from Florence and Fred, last season so no longer available but you can find similar boots on my blog post here. 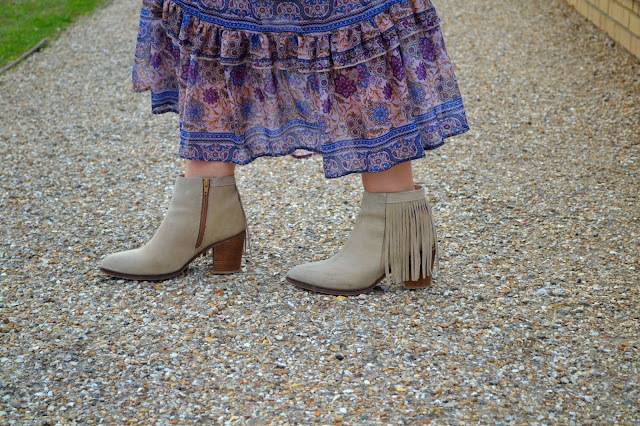 I hope you agree with me about wearing booties with a maxi dress. Please let me know if you've worn a maxi skirt or dress with boots, I'd like to hear what your opinions are. These Photographs were taken by my very talented god-daughter Esther Ruby, I think she's done and amazing job and I'm thrilled with them. Back soon with a warmer, season friendly outfit - and remember we did have some warmer weather in the summer and it will return eventually. 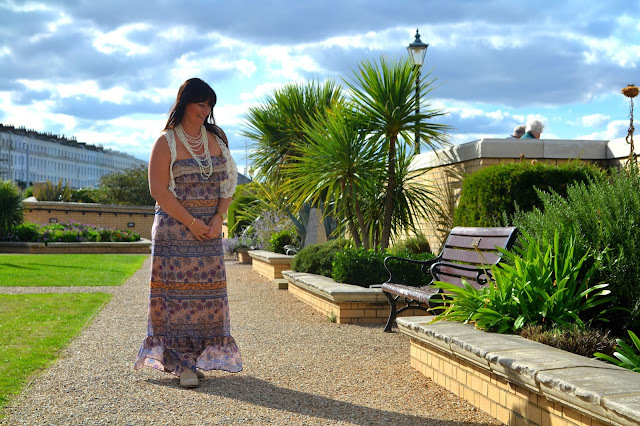 Linking today with Sydneyfashionhunter and Finewhateverblog. 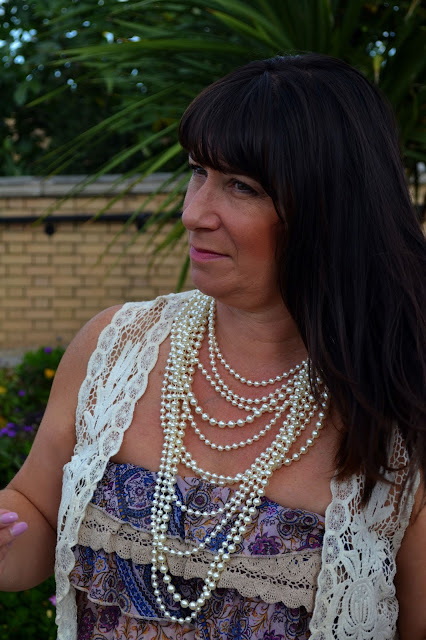 What a pretty dress and LOVE the pearls with it!!!! 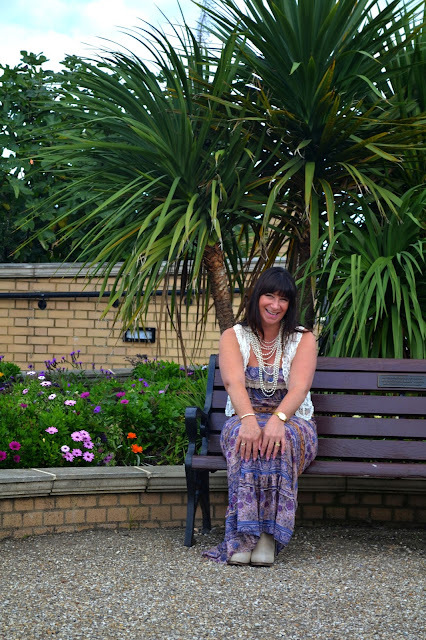 I am all about a boho vibe outfit! I love this! You look so pretty in this maxi dress! Thank you very much Ruth, Kind words and thanks for stopping by. Jacqui, we have been so amazingly fortunate to have this autumn. Today I was out walking in a camisole and thin cardi. I kept telling myself "it's nearly November!". I think you're feeling the same amazement. Yes, it feels exciting when you wear something you really do enjoy and from your piece today, I'm guessing it's those cute little bootees! We've certainly been very lucky with our weather Mary, thanks for your lovely comments and for stopping by. I really like both the maxi & the ankle booties with it! Hi Jacqui. You are lucky to be able to wear maxi dresses. I've tried them and they look horrid on me. Love that last shot by the monument. I've only got two long maxi dresses, but feel good whenever I wear them, some great photos by my god-daughter. Some more in the pipe line which I'm thrilled about! Hi Jacqui lovely colors in your dress. I like the addition of the pearls . Those boots are fabulous! I love a long dress with boots, and boy your weather looks inviting!